U4760-PB-PK is rated 5.0 out of 5 by 2. Rated 5 out of 5 by Discerning Decider from Perfect for multi-person households This gadget is to control flow of water in the shower which is does very well. Only drawback is that it doesn't seem that you can obtain the full flow shower had prior to installation no matter how you turn the black knob. It is still good if you want to reduce the amount of water your family (kids) uses. 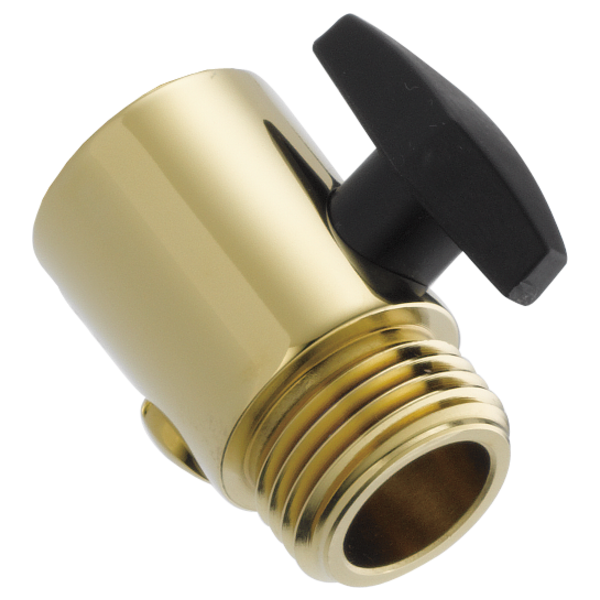 Also note that it is not a shut-off valve which means you cannot use it to completely stop the water flow between suds/rinse of your own hair or when washing a pet. Rated 5 out of 5 by Aidan from Excellent addition to our shower Our shower doesn't have any flow control. You just turn the knob to adjust the temperature. This "volume control" attachment did the trick. In the past, we either had a fire hose (which wasted water) or we had the flow control washer (which didn't give enough water pressure for a good shower). Now we can save water most of the time, but crank up the pressure when we feel like we a stronger rinse. This little beauty was expensive, especially in the bronze finish that matches our hardware. Maybe over the life of the unit we will save enough water to pay back the investment. Maybe. That said, it does make for a nicer shower, so it was worth it to us. Looks nice and functions as expected. Does this Delta Volume Control completely shut off the water flow? Do you have a volume control that completely shuts off the water? is the U4760pk ADA compliant? Do you have a part that will shut off the water flow completely? What are the differences of this volume control and RP6124?